Fairytale adaptations are no stranger to the pop culture landscape, but it does seem like they have been particularly rampant recently. ABC's Once Upon a Time just concluded its first season, the CW announced a new series Beauty and the Beast at this spring's Upfronts, and Julia Roberts brought her signature cackle to the... uh... politely-received Mirror Mirror back in March. From the trailer, it doesn't look like the movie is going to back away from the darker aspects of the story—c'mon, the Queen wants to eat this girl's heart—and Charlize Theron is doing some serious scenery chewing in that castle. And legendary costume designer Colleen Atwood (Chicago, Sweeney Todd, Alice in Wonderland, etc etc etc) has brought her usual amazing touch to bring the already-stellar art direction to a new level. Count me in. 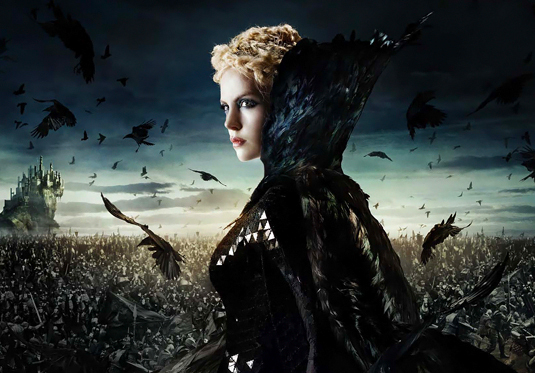 Snow White and the Hunstman hits theaters Friday, June 1.